APB All Points Bulletin is now available on Steam for Pre-Purchase. Will you choose to play as a criminal or an enforcer? Join this living, breathing Pacific Rim city with streets full of vehicles and thousands of civilians. Your mission: gain fame and fortune, fast. 3 Days Early Game Access: Includes 10 Hours of district gameplay and unlimited social gameplay. 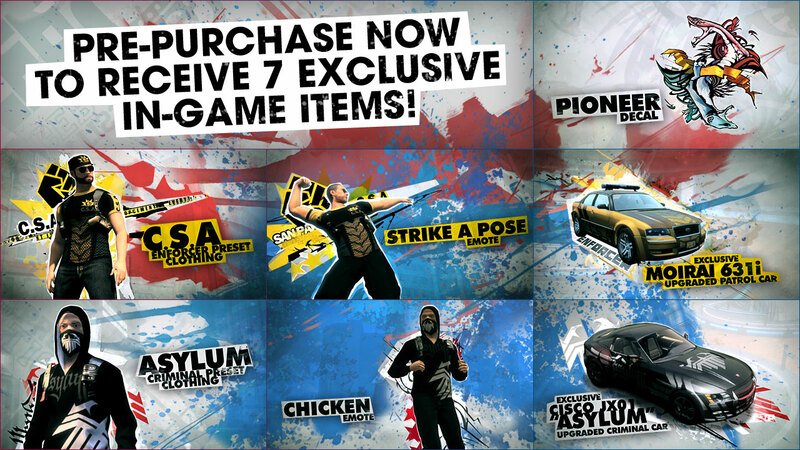 7 Exclusive In Game Items: Includes the Chicken and Strike a Pose Emote's, Criminal and Enforcer Cars, Criminal and CSA Outfit's along with a Pioneer Decal!